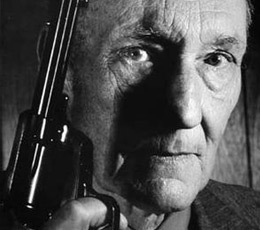 Is Obama a secret fan of William S. Burroughs? The mainstream news monster is half-blind and barely functional, as Matt Bai recently demonstrated with his piece about Democratic challengers to Obama’s renomination. Early on, you realize there are no challengers, not yet, and that the article is a “what if” piece based on Bai’s hunch that Obama’s abysmal performance thus far might inspire progressive Democrats to field a candidate. Bai’s article isn’t labeled “analysis,” but that’s what it’s supposed to be. In journalese, analysis means that the reporter takes the facts of the news story and tells you what they mean in the context of the big picture. Thus, the angry reaction of Democratic legislators to Obama’s tax-cut compromise with Republicans “is bound to intensify a debate” over whether the president “should face a primary challenge in 2012.” But “bound to” means there is no challenge as of yet, no actual story. Note the spin in Bai’s piece. He writes that a primary challenge would come from “self-described progressive critics” of Obama, as if all Democratic critics of Obama are not only progressives, but self-described progressives. His language is flip, inaccurate and obviously biased, but he gets to pretend it is none of those things. He’s merely writing an analysis, even though he’s analyzing a story that hasn’t happened and using judgmental terms to indicate his disapproval of progressives. The Kennedy reference is not only biased, but strange. Bai states that today’s liberals (are liberals and progressives the same thing?) see in Obama the same qualities a previous generation saw in “the hipster Kennedy.” Does that mean Obama is a hipster or merely that his fans think he is? And what does Bai mean by hipster? The word could refer to Beat Generation artist/bad guys like William S. Burroughs, or it might be a contemporary usage and refer to mild-mannered, shabbily dressed young urbanites who hang out in coffeehouses and have no strong political leanings. Take a chill pill, Matt, and try saying what you mean. Your false neutrality merely makes you seem sneaky, and more than a little incoherent. This entry was posted in mainstream media, mid-term elections, New York Times, Obama, Politics and tagged analysis, bias, Herbert Huncke, hipster, John F. Kennedy, mainstream news, Matt Bai, New York Times, Obama, William Burroughs. Bookmark the permalink.